Never before in the history of Silver Dollar City theme park has there been such excitement, such enthusiasm over the opening of a new attraction. With its March 14 debut, Time Traveler, the World’s Fastest, Steepest and Tallest Complete-Circuit Spinning Roller Coaster, marks a new era in coasters, delivering ride experiences unlike any before, with no two rides alike. A major difference is the spin, which is not a teacup-ride fast spin but a limited spin that delivers high dimension, sensations and perspectives that differ with every car, every ride, every time. 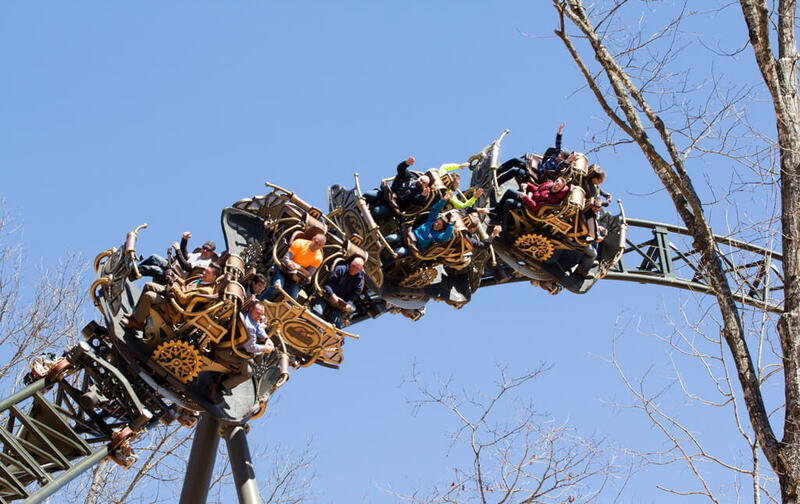 This custom-designed, custom-engineered ride that introduces a new generation of thrill coasters for families was more than two years in planning and construction, and is Silver Dollar City’s biggest attraction ever with an investment of $26 million. For concept, design and development, Silver Dollar City chose renowned coaster manufacturer Mack Rides. “Since Silver Dollar City’s opening day in 1960, guests have taken a journey back in time with unique and world-class experiences. We strive daily to continue that tradition through our rides, our festivals, our crafts and our food. That pursuit continues in 2018 with Time Traveler – a Revolutionary Coaster Ahead of Our Time,” said Thomas.